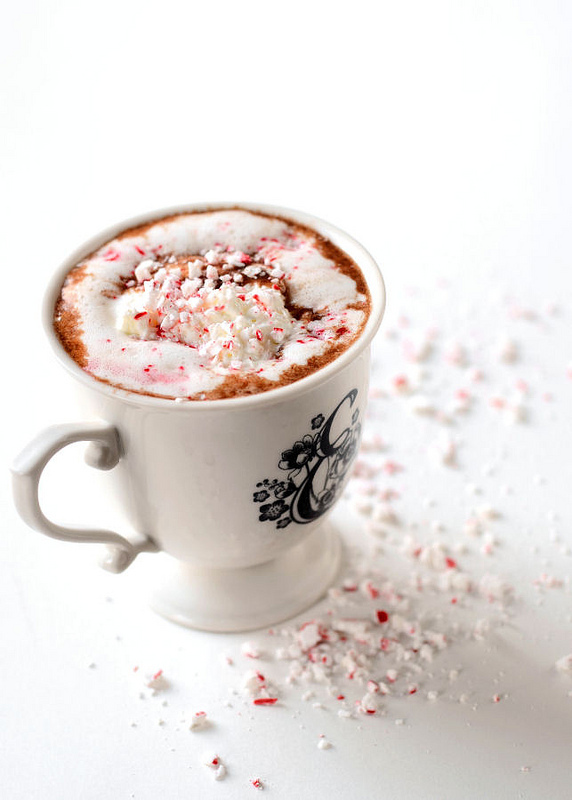 This Homemade Peppermint Hot Chocolate is the perfect Christmas/winter treat. This was originally posted on Cooking for Seven on December 12, 2012. Enjoy! For some reason, I have been averse to pairing mint with chocolate my whole life. Whenever someone would order a mint mocha or mint chocolate chip ice cream I would inwardly shake my head in wonderment. Why ruin perfectly good chocolate with mint? But I heard people raving about the peppermint hot chocolate at Starbucks. Could I be wrong in my presumption? I decided to give this mint-and-chocolate thing a try. Am I ever glad I did. 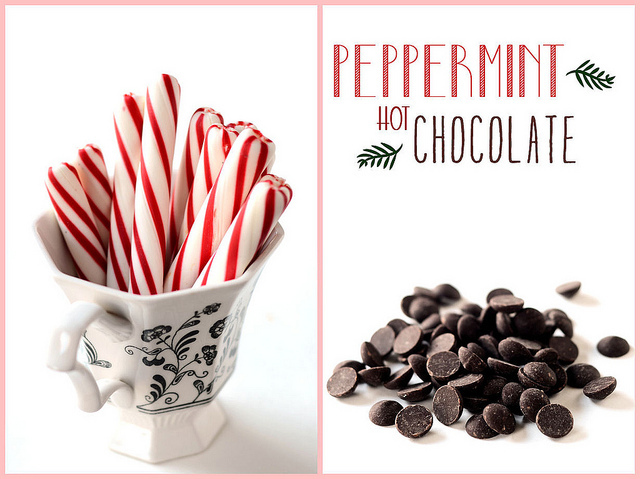 The fresh, strong flavor of peppermint lightens the rich, heavy hot chocolate perfectly. Which means you can drink more of this scrumptious beverage without feeling overwhelmed by the creaminess. The original recipe suggests chopping your chocolate, but I just used chocolate chips and they melted perfectly. The OR also directs you to bring the milk/cream to a boil and add it to the chocolate. I just put it all in a pot and let it melt together. Worked wonderfully! The peppermint flavor that I used left little grease puddles at the top of my hot chocolate. If you’re a purist, go for a non oil-based flavoring. I added a few drops of the peppermint flavoring to the whipped cream just for kicks. I highly recommend it. If you’re not ready to take the plunge for peppermint hot chocolate, why try my regular Hot Chocolate recipe? It’s pretty amazing – kind of like drinking chocolate pudding! Place 1/2 cup cream, 2 tablespoons sugar, the milk and chocolate in a small, heavy-bottomed saucepan. Cook over medium heat, whisking constantly, until the chocolate has completely melted and is smooth. Remove from heat and stir in the peppermint flavor. In a small bowl, beat the remaining 1/2 cup chilled cream with a few drops of peppermint flavor (optional) until soft peaks form. 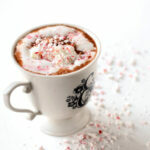 Serve the hot chocolate with whipped cream and a sprinkling of crushed candy canes. Enjoy! Peppermint hot chocolate is the best! I will be sure to try your recipe. Oh, and this makes me miss my Anthropologie cup. I had the exact same one, but broke it on my blender blade when washing them. Haha, at least you know the blade is good. Try adding a small scoop of peppermint ice cream to your very hot chocolate. It is amazing!